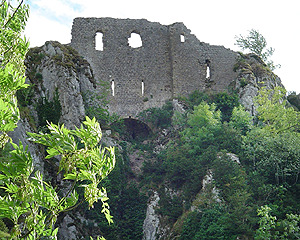 The Château de Roquefixade is a ruined Cathar castle built on a cliff overlooking the village of Roquefixade. It lies 8km (5 miles) west of Lavelanet in the département of Ariège in Southern France. 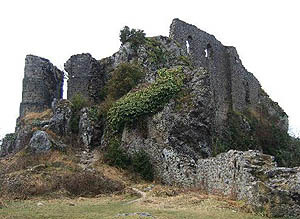 There are records of a castle on the site going back to 1180, though the present ruins are more recent. A castle on this site provided refuge for Cathars at the time of the Cathar wars (Albigensian Crusade). The Château de Roquefixade has been listed as a Historical Monument (monument historique) by the French Ministry of Culture since 1995. It is open to the public. An earlier Chateau de Roquefixade was built in the 11th-century. Its existence is attested in 1034. No doubt a village existed here from the same period although it is not mentioned in surviving texts until the 13th century. The fist known lords of the castle are the seigneurs de Pailhès, a branch of the family de Rabat, who all seem to have used the name Bernard Amiel de Pailhès. 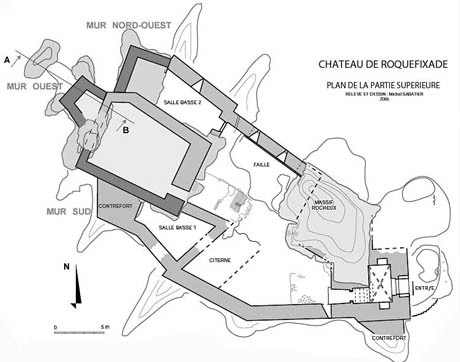 In 1180, a château is mentioned here, belonging to the family of Villemur or Fourquevaux. In 1200, Raymond de Pereille, Lord of Montsegur, married Corba de Lanta, whose family owned Chateau de Roquefixade. This family rendered homage for the fief to the Counts of Foix. During the Cathar Wars the lords of Roquefixade fought beside their liege lords, the Counts of Foix and the Counts of Toulouse. For this reason, the village was razed by the troops of Simon de Montfort, the leader of the Crusade. 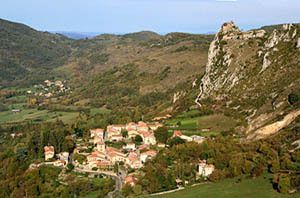 Although the Chateau de Roquefixade did not play a pivotal role in the Crusade, it became a retreat for the Cathar heretics after the Treaty of Meaux (or Treaty of Paris) was signed in 1229. Guilhem de Plaigne one of the key protagonists in the massacre of the Inquisitors at Avignonet (1242) and a knight of the garrison at Montsegur during the siege of Montsegur (1243-4) was living here at Roquefixade in En 1246. Since he had built a chateau near Plaigne in the Aude one might speculate that he felt safer here after the fall of Montsegur. There seems to have been a conflict in 1243 concerning rights over Roquefixade and involving the Counts of Toulouse. Because of its strategic importance, the château was integrated into the system of defence for the Pays d'Olmes.. In 1258, the King of France and defined the frontiers with Aragon in the traité de Corbeil. Roquefixade and Monségur, were fixed as the south-west limit of the French territory. In 1270, King Philippe III (le Hardi) bought the rights to Roquefixade from Ro Raymond-Roger de Pailhès, in order to control the site and defend the area. Just two years later, in 1272, the occupants of the château give their support to the Count of Foix during his revolt against Philippe III le Hardi. In the same year the village is mentioned among the goods of the Count of Foix. When the Count of Foix surrendered the king seized the Château de Roquefixade, but he seems not to held into it because in 1278 the château was purchased by the French King, who restored and maintained the fortifications and installed a garrison. In 1302 the garrison included a chatelaine (Castilian), a lookout (guetteur), a door keeper (portier), a dozen sergeants and a number of guard dogs. 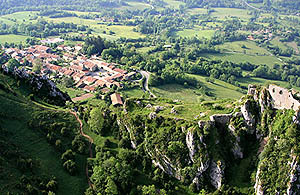 Roquefixade became a stronghold at the end of a line of royal fortresses to keep watch on the territory of the Count of Foix. The village (altitude 803 m) was purchased by the French Crown ten years later in 1288. On the order of the sénéchal de Carcassonne, Simon Brisetête (or Briatexte), a bastide was built here ("for the exaltation of the Holy Catholic Church and the extirpation of heresy" and called the Bastide de Monfort. It was given a royal charter and certain privileges. Roquefixade then became the capital of a territory of the Languedoc called Esponne, up until the French Révolution. In 1463, Louis XI restored the château to Gaston IV, Count of Foix. In 1632, Henri II, duc de Montmorency, governor of the Languedoc, revolted against the Royal power, or more specifically against Cardinal Richelieu. Roquefixade was part of the revolt. When Henri was defeated later in the year, the French king Louis XIII visited the area on his way to Toulouse for the Duke's execution. Louis took the opportunity to order the destruction of Roquefixade, as it serving no royal purpose, was costly to maintain, had a history of rebellion, and might otherwise provide an operational centre for brigands (like Termes). It was slighted along with the châteaux of Montaut, Tarascon, and Labastide de Sérou. In 1633, the lord de La Forest Toyras, royal governor of Foix, ordered the Sieur de Caraybat to demolish the castle. The site was used as a stone quarry, a "carrière de pierre". In the 17th century the De Caulet, family, Capitouls of Toulouse, bought the seigneurie. It then passed by marriage to the house of de Lévis when Marguerite de Caulet, sister of François-Etienne, Bishop of Pamiers, married Jean de Lévis, Baron of Lavelanet. In 1675, the site was sold to Vital Guilhon de Lestang, baron de Celles, whose family retained it until the Révolution. It was then sold as a national asset (bien national). Around 1792, it was sold as a bien national. Château de Roquefixade has been listed as a monument historique by the French Ministry of Culture since 1995. 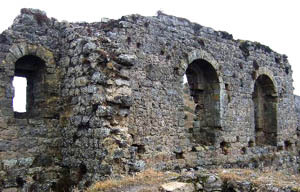 Archaeological digs have been conducted since the late twentieth century. 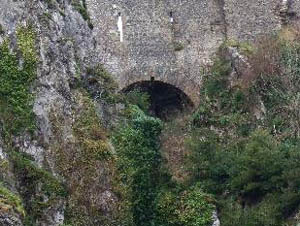 A natural cleft in the cliff face has been filled in by an arch, supported by ramparts. 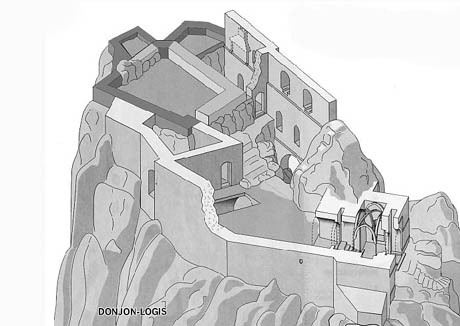 This cleft is the origin of the name of the castle: in Catalan roca fisada means "fissured rock". 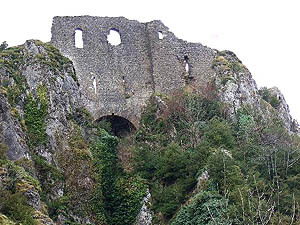 The remains of the castle walls cling to the rock, originally circling an impressive keep built at the highest point of the site. It was a vast fortress, more than a hundred meters in length. The surviving architecture of the château is varied and reflects several phases of building over the centuries.. 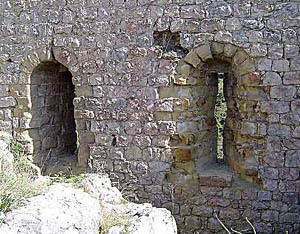 The keep was remodelled in the 14th century, and several rooms rebuilt. Other alterations were made in the 15th and 16th centuries. 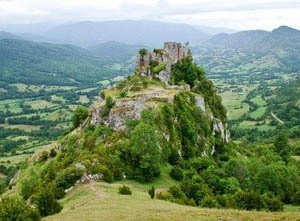 The remains of Chateau de Roquefixade are relatively scant, like those of many other Cathar Castles. An access path runs along the cliff to the north, then meanders through a steep field. On the right, the cliff is very steep. Above a large fissure above rests a vault on the north wall of the castle. The gatehouse (châtelet). The castle entrance is via a gatehouse, which comprises two successive doors. It is narrow cut in the rock and provided with two ports cullis. Between its two doors - a stunner is still visible. 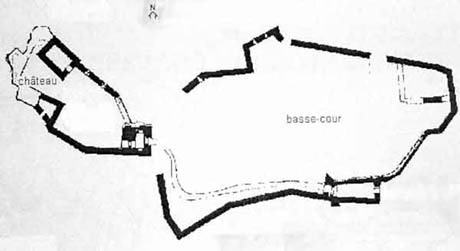 The lower court (La basse cour). The lower court takes up the majority of the site area. 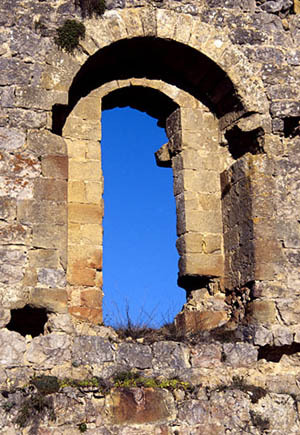 It is surrounded by a curtain wall extending the line formed by the ridges. On the highest point of the rock barrier, some traces of the 14th Century keep (donjon) remain. 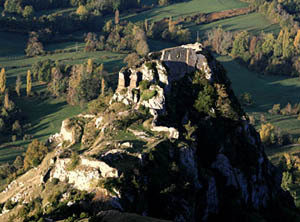 From the summit, the Lords of Roquefixade could communicate by fire with the castle of Montsegur. Today the commune Roquefixade (postcode 09300) lies in the canton of Lavelanet in the arrondissement of Foix, in the Ariege department in the Midi-Pyrenees region. 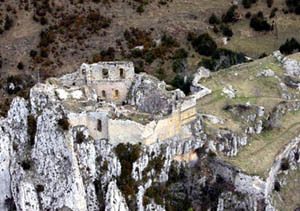 Chateau de Roquefixade is perched high up on a limestone crag occupying one of the most impressive sites in Cathar country. You can climb up to the castle (in sturdy walking boots) to be rewarded with views that include the Ariege mountains, the Pyrenees, Montsegur, Les Corbieres and Le Lauragais. The walk to Chateau de Roquefixade is well sign posted. This walk from Roquefixade village square to Chateau de Roquefixade should take about 25 minutes. Start from Roquefixade village square. Walk up a well maintained gravel track. From the track you will reach a grass verge on the right. Walk up the steps. Continue on the path through trees and scrub. The Chateau should always be on your right. You will reach the ruins of the outside walls. Walk through these walls and follow the small path that leads you to the Chateau. Care should be taken on this path as it can be slippery. Once inside the Chateau you can explore the ruins and see fantastic panoramic views.